La Finca Madrid – a captivating blend of show-stopping singularity, profuse stylishness and uncomparable comfort. An architectural masterpiece that seamlessly combines ultra-luxurious living with a visually stunning presentation, irrefutable sophistication, and indulgent comfort. This remarkable La Finca, Madrid is an impressive mega-mansion that combines astounding architectural refinement and generous scale with an esteemed address. Every distinctive detail of this exceptional property has been meticulously crafted to deliver refined living of the highest standard in one of Madrid’s most coveted neighbourhoods. 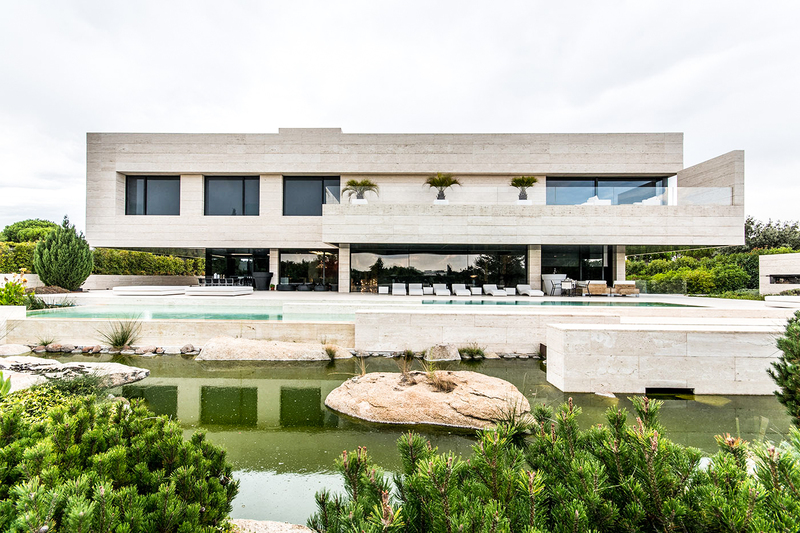 Designed by the distinguished architectural studio A-cero, this lavish La Finca residence in Madrid has been expertly shaped by visionary imagination and boasts an impressive designer pedigree. The contemporary undeviating exteriors of this eye-catching property offer a striking proportioned aesthetic, while the interior design impeccably balances modern opulence, warmth and functionality to offer a grand, yet inviting and sociable, living and entertaining environment. Prestigiously located in what is incontestably one of Spain’s most highly desirable residential areas, this elegant La Finca property is ideal for discerning individuals who are seeking an opportunity to live in a privileged community in Madrid. This exceptional residence boasts spectacular defining elements of architectonic modernity in their most pure forms. 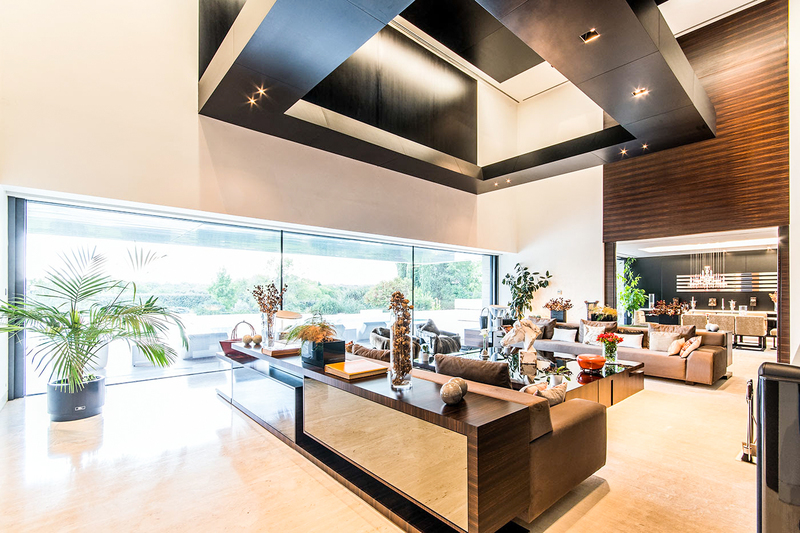 Featuring stunning architecture throughout and a dazzling open-plan layout that impeccably balances the outdoor and indoor spaces, this beautiful La Finca property delivers unrivalled architectural flamboyance that achieves a new standard in luxurious urban living. Visually captivating in its arresting, compositional refinement – the contemporary aesthetic is expertly realized through the virtue of the cutting-edge design – which embodies fresh, clean lines, floor-to-ceiling glass, and great spatial flow and openness. 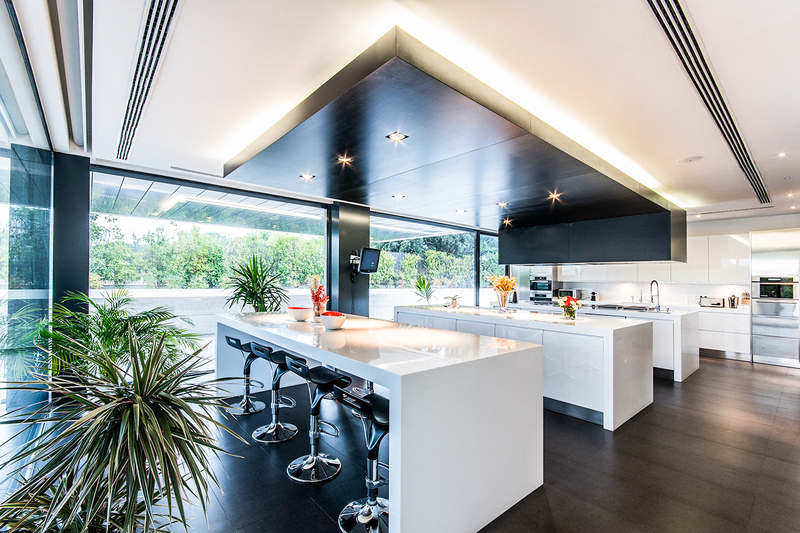 Exhibiting architectural excellence, this property combines the aesthetic of horizontal lines with the lavish use of light and volume to perfectly emphasize the superior beauty and scale of this fine home. The interior areas of the villa exude an indulgent fluidity that is enriched by the absence of walls yet pulled expertly together by skilfully executed zone-to-zone interior design that provokes an enticing continuity between the outdoor and indoor spaces. Guests and owners alike will feel truly at home with the polished palette of tones and textures that convey an overwhelming sense of sophistication and a discreet luxuriousness. The clean geometric lines and the intricate balance of stone, wood, and glass work in perfect harmony to produce an overall effect of effortless elegance and contemporary class. 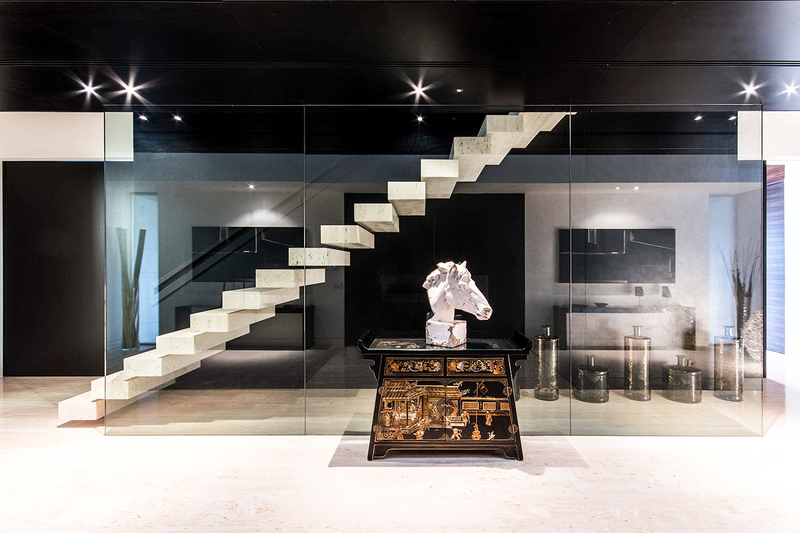 The sculptural form of the floating staircase commands the eye while the carefully planned use of lighting, high-quality fixtures, and the latest smart home technologies add to the sense of supreme lavishness and panache. Encompassing 1,850 sqm of design perfection, this exclusive La Finca property for sale is imbued with spectacular flair and comfort, offering a breathtaking setting for sophisticated entertaining or contemporary family life. Offering an unforgettable first impression, the striking reception hall offers an alluring initial hint at the many magnificent features that are yet to come. Defined by dramatic extravagance and monumental dimensions, the mesmerizing vast great room offers a flamboyantly balanced setting comprised of a lounge/TV area, a dining area and a living area with fireplace and soaring ceilings. The colossal gourmet kitchen is fully equipped with top-of-the-line appliances and sleek cabinetry of the highest quality. As glamorous as it is functional, the kitchen comes with numerous countertops, a central island and a breakfast bar for casual dining. Offering a versatile and comfortable living environment, the property houses in total seven bedrooms and eight bathrooms. The master bedroom boasts magnificent floor-to-ceiling windows, which lead to a glorious terrace offering lovely views, a generous dressing room, and en-suite bathroom with shower and separate bathtub. There is also a convenient second living area, office, home cinema area, and a cellar/wine bar. The lower level of this La Finca property has been converted into a personal retreat that is dedicated to wellbeing and fitness, with a spa area, indoor pool, Turkish bath, and gym. This contemporary villa in Madrid is studded with an abundance of modern conveniences that offer an impeccable lifestyle of sheer extravagance and comfort. In addition to an elevator, extensive laundry area, two storage rooms, and staff quarters fitted out with a bedroom and bathroom, there is also a change-of-season dressing room and parking for six vehicles. 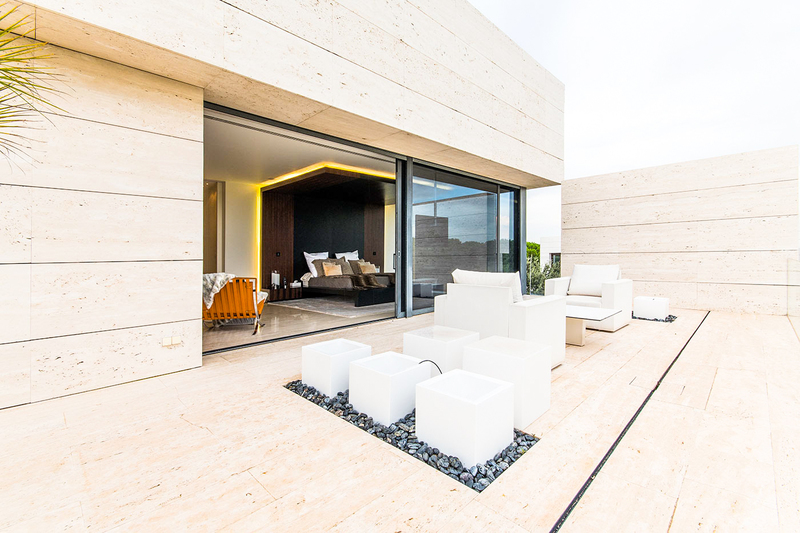 The indulgent outdoor living areas are as imposing and spellbinding as the interior and represent the idea space in which the residents can escape the hustle and bustle of Madrid to enjoy refined serenity in a true oasis of peace and tranquillity. Elegantly designed to achieve the perfect balance of entertaining, dining and relaxing spaces, the immense scale of the sprawling outdoor areas are truly jaw-dropping, while the glistening private pool acts as a spectacular focal point. The detached home occupies an extensive 4,300m² plot that delivers a transcendent impression of refined space and privacy. Ideally positioned just eight kilometres from the centre of the city of Madrid – yet ostensibly a world away, the stylish villa in La Finca offers the discerning buyer an enviable lifestyle of prestige, affluence and bliss while also being conveniently located within proximity of all the amenities of Madrid itself. Radiating elegance, refinement and supremacy, this prestigious La Finca property in Madrid is indisputably one of the finest in La Finca.